Whew! As much as I enjoyed the Restoration Project, it’s nice to be switching gears. If you haven’t already done so, there’s still a few days left to subscribe to my blog via email (at the top right) to receive the free “Pray Bold & Unedited” printable. I’m also going to be surveying my subscribers about a variety of ebook topics to see which one they’d most enjoy. 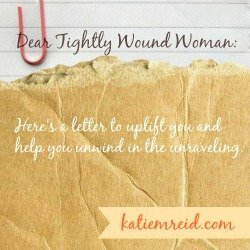 It’s time for your monthly letter #TightlyWoundWoman. Find a quiet spot and let the Lord’s love refresh your spirit. You’ve been feeling kind of lousy. You’ve come face-to-face with your failures and you don’t like it one bit. You’ve been trying to gain ground by doing and doing and you’ve marched past my glory on your quest for significance. Remember Daughter, “I’m rich in love and slow to anger”. I am rooting for you and long to give you fresh revelation. I know it’s hard to come to terms with the fact that you can’t do this on your own. And I’m here, willingly—readily available to help, as you stop and admit your need, your lack, your weaknesses. I know you pride yourself on being capable and creative, but both of these characteristics originate with Me. You keep trying to muster up change and command better resolve, but Daughter, you can cease striving. You can sit down, for I am enough for You. You are not an orphan. 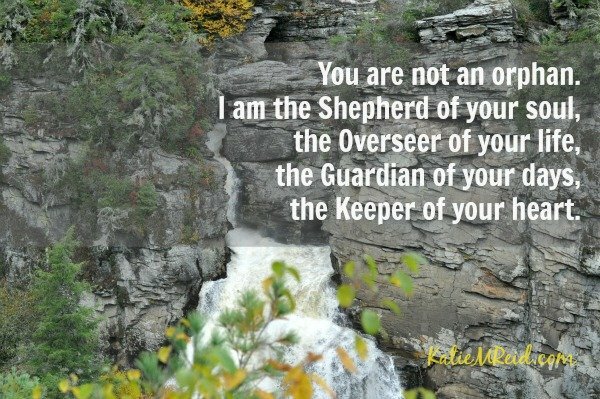 I am the Shepherd of your soul, the Overseer of your life, the Guardian of your days, the Keeper of your heart. And, oh how I love you. I love you—just as you are. I came for you while you were still a sinner. And my love doesn’t stop, quit, walk out or get fed up with you. Oh, yes, I long to see you free and whole. But I am Patient as well as Powerful, I am Kind as well as King, I am Healer as well as Holy. And you belong to me. I am interceding for you and praying that this truth will move from your head to your heart. At times it feels like a long journey, but you are taking ground as you follow my lead. When you seek my glory over significance you find abundant life. You find this kind of life by bowing—not to a crowd as they applaud, but to my majesty as I reign over my kingdom. I am the Just Ruler. I am the God of the Universe and I hold you in the palm of my hand. You can trust me. I’ve got you covered. P.P.S. Linking up with Kelly Balarie’s #RaRaLinkup on Purposeful Faith. « The Restoration Project Wrap-Up and Thank You Gift!